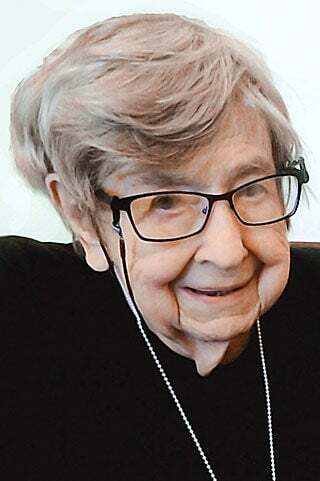 Avis G. Erickson, age 89, passed away peacefully at Mayo Clinic Health System — Eau Claire, WI, on Saturday, April 6, 2019. Avis was born on March 25, 1930 to Norris and Gladys Tollefson. She grew up on the family farm in the Town of Pleasant Valley and graduated from the Eau Claire Senior High School in 1948. She was married to Dale Erickson on June 12, 1948. Together they shared 68 wonderful years before he passed away in 2016. Avis worked for many years at Luther Hospital where she was the manager of the EKG Department. She later worked for Dr. Kincaid at Midelfort Clinic, retiring from there in 1992. After she retired, she spent a lot of time working with Dale on their hobby farm in the Town of Drammen and at their family cabin on Nelson Lake in Hayward, WI. They traveled much of North America: ranging from Canada and Alaska to Arizona, Texas and Florida where they owned a cottage in Mexico Beach, FL, near their daughter and son-in-law. Avis had many hobbies and passions in life, as her family and friends can attest. Her primary passion was her family. She was very fond, proud and loving toward her children, grandchildren and great-grandchildren. Avis was a wonderful host to countless family gatherings, preparing large meals over the years at her home and in the screen house. She loved country music and had several favorite singers. Avis had a strong faith in the Lord and lived her life guided by His principles and values. Avis is survived by her son, Bill (Pat) of Tomahawk, WI; daughter, Jayne (James) Bellesbach of Port St. Joe, FL; daughter-in-law, Karen Erickson of Salcha, AK; six grandchildren, Raith (Katja) of Fort Washington, MD, Kaiya (Brandon) Carlson of Anchorage, AK, Tanya (Tony) Hollis of Fairbanks, AK, Ty (Karin) Erickson of Duluth, MN, Jackie (Tom) Arns of Peyton, CO, and Justin Bellesbach of Boca Roton, FL. 13 great-grandchildren; sister, Sharon Vogler of Eau Claire; brother, Ron (Roxy) Tollefson of Ham Lake, MN; special uncle, LaVern Halvorson of Eau Claire; sister-in-law, Clarice Erickson of Eleva, WI; and several nieces, nephews, other relatives and friends. Avis is preceded in death by her parents; husband, Dale; son, Ken; sister, Delores; and brother-in-law, Bernard Vogler. Avis’ family would like to thank Dr. Parisi, the nurses at Mayo Clinic Health System and Milestone Memory Care for their kind and compassionate care. Funeral Services will be at 11:00 a.m. on Saturday, April 13, 2019, at Pleasant Valley Lutheran Church, W2450 Co Rd WW, Eleva, WI. with Pastor JonPaul Dragseth officiating. Visitation will be held from 9:00 a.m. until the time of the service at the church. Burial will be in the Pleasant Valley Lutheran Church Cemetery. Lenmark-Gomsrud-Linn Funeral & Cremation Services is assisting the family. To express online condolences, please visit www.lenmarkfh.com.